I recently bought the Rag & Bone Victorian Plaid shirt on the left from Piperlime and getting it in my hands has reminded me how versatile plaid can be. I’m willing to spend on plaid because its one of few things that’s always lasted me throughout the seasons — and I’m in love with the shirt’s unusual collar. Blame it on my California influence, but nothing says easy, on-the-go style to me better than a plaid shirt and jeans or shorts. It’s the perfect look to throw on as I head out to class. My favorite plaid is one that has red undertones, but I’m also partial to anything anything that’s blue, black and white or grey as well. Try to avoid plaids that look like flannel or are Christmas-colored to keep it sophisticated and not lumber-jack looking. Reaching to celebrities for inspiration, Mary Kate Olsen looks great, elevating her boyfriend plaid with heavy accessories and red wayfarers. Jessica Alba throws on a matching scarf, cropped skinny jeans and flats. Kate Bosworth makes it elegant with a ruffled plaid shirt, wide-leg trouser jeans and a red purse. I recommend accessorizing your plaid shirt with solid-colored accessories, playing off colors that are in the pattern, especially the more subtle ones. 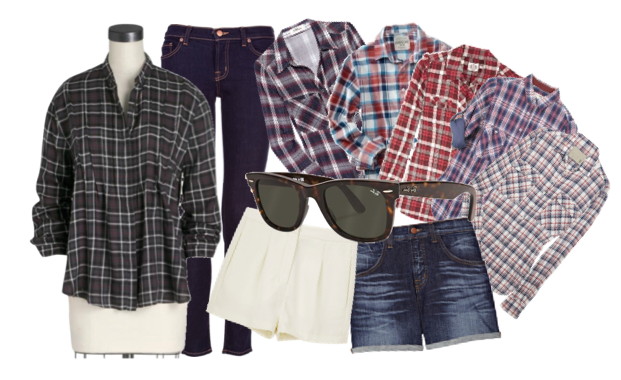 Since plaid is a throw-on-and-go type of shirt for me, I like to keep it simple, but plaid shirts are such a wardrobe staple now, they can be worn in any way your heart desires.